Did I say ‘wordless’? Okay, so it’s not completely wordless. Today is my 41st birthday. I do not dread this day (nor did I dread the big four-o day). These are the happiest times in my life. There have been a lot of bumps in my early years, but one great thing has been constant for all 41 of them and that is dogs. Let me share them with you. I showed you a photo of this dog last week. 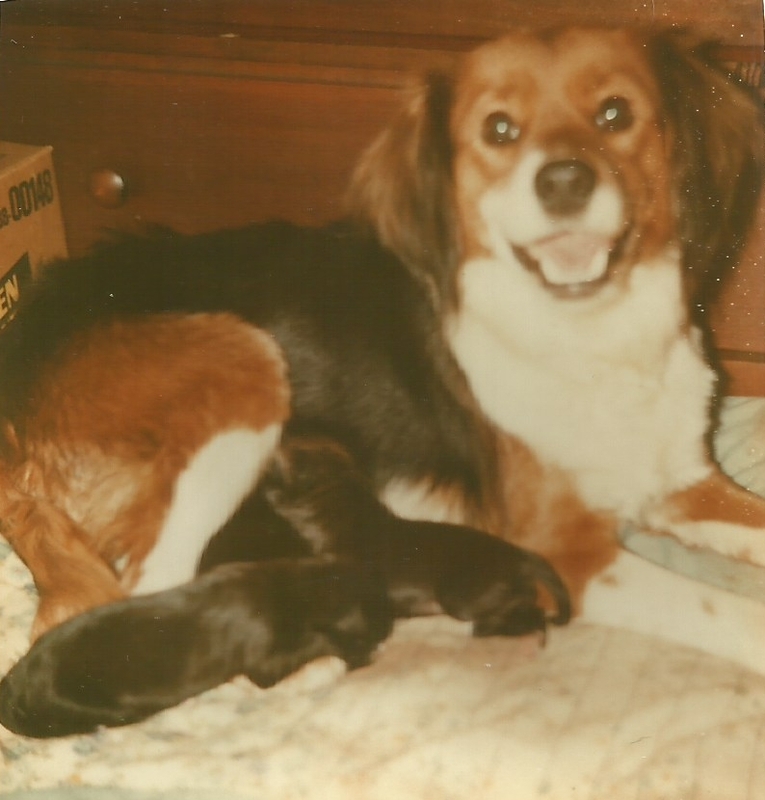 Wendy wasn’t just special to my mom, she was special to me because she was the first dog I was ever exposed to. My mom was worried about how Wendy would react to me as a newborn baby. Luckily, Wendy adored me and she was very protective of me. She would sleep under my crib and she’d watch me carefully whenever anyone held me. I showed you this photo last week too. 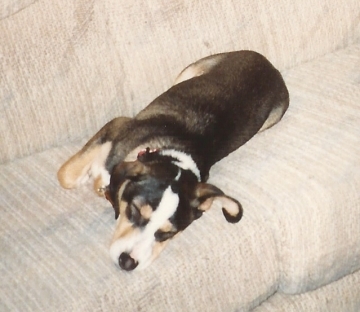 While I was growing up, my mom had a number of dogs, but Cassie was the first dog that was considered my dog. When my mom took Cassie in, I was just 10 years old. Cassie immediately attached herself to me and would only sleep with me in my room, even when it was my sister’s turn to have her. After I moved out of my parent’s house I, of course, took Cassie with me. 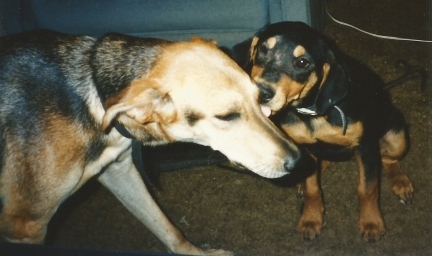 Cassie was getting older and I thought a new puppy would liven things up a bit. Cassie wasn’t as thrilled about Smokey as I was, but they did play from time to time and Smokey did put a bit of a spring into her step. My dog Smokey was my hiking buddy. We spent three days roughing it as we hiked around Georgetown Lake in Texas. Here’s a better photo of my dog Smokey, also taken at Georgetown Lake. 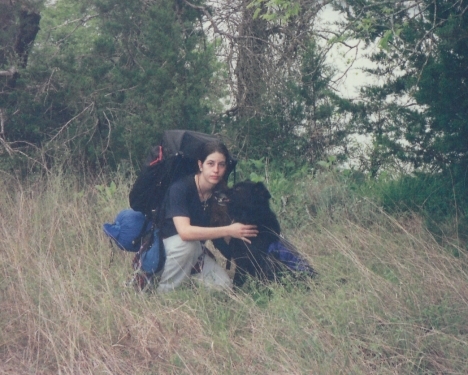 Smokey and I did a lot of outdoor things together. 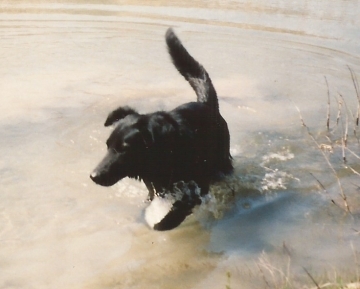 Swimming was one of his favorites. After a year or so of getting Smokey, I started working for the animal shelter in Austin, Texas. 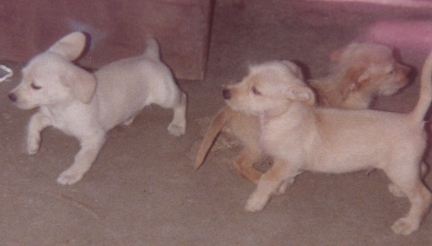 Since then I adopted and fostered a number of dogs (and cats). I don’t talk about them as much as the others because I had to leave them with my ex after we got divorced. The divorce ended badly so I do not know what became of them. I can only hope he cared for them or gave them to good homes. Huck with Scrapper and Grady. 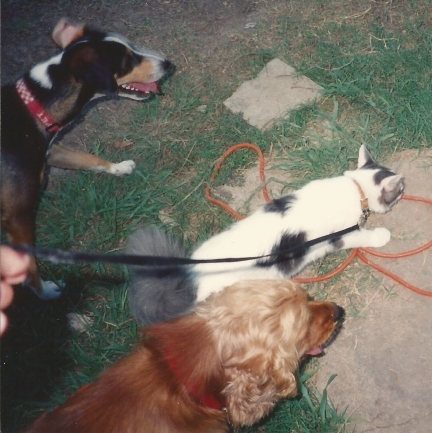 Scrapper is the cat and he loved to walk on a leash outside. 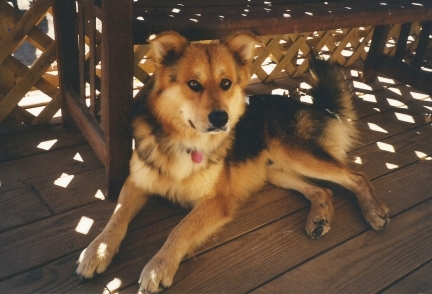 Grady was my dad and stepmom’s dog. They gave up Grady because they couldn’t train him. They do not have the dog-sense that my mom has. Patra (short for Cleopatra) is the tortoiseshell cat and is the first cat I rescued from the animal shelter. She was a stray and was in rabies observation for a week for scratching a child. She was going to be euthenized but I didn’t let it happen. 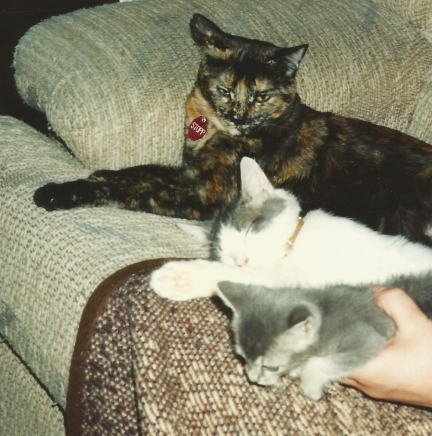 I don’t remember how I got Scrapper, the white with gray kitty. And Dillan, the all gray kitten, was rescued from the jaws of a Doberman named Dillan. I fostered Molly for a few weeks, during which time she earned the nickname of Molly McButter. From left to top then bottom right: Skittles, Max, and Puddles. These were foster pups I had for a few weeks. 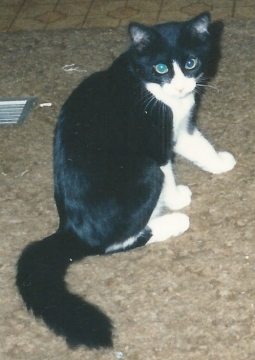 I honestly don’t remember how I got Spider (so named because he often climbed the curtains and walls). He is one of the ones I was forced to leave behind when I got divorced. 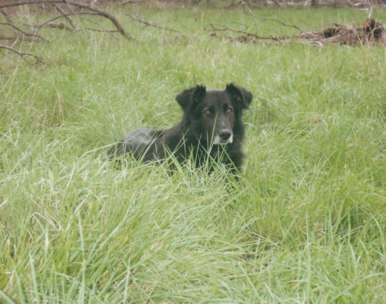 If you’ve been following this blog, then you remember this dog. Like my dog Achilles, Sephi was named from Greek mythology (short for Persephone). My ex gave Sephi to me because he felt guilty for cheating on me. Of course, I didn’t know this at the time. Sephi was the only dog I was able to keep from the divorce. I couldn’t keep the others because I wasn’t working and so my ex got to keep our house. Sephi was my sole companion for many hears after my divorce. 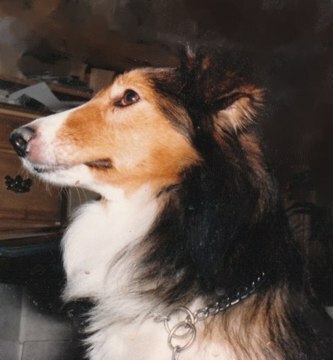 She passed away at the age of 11 in November 2011. My two current best buds are Maya and Pierson. 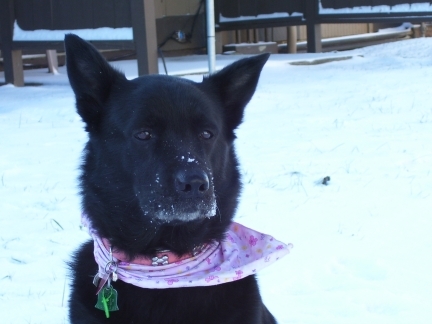 Maya was adopted by a family with two toddlers and an infant. After one week, they posted her on Craigslist and I was the lucky responder. 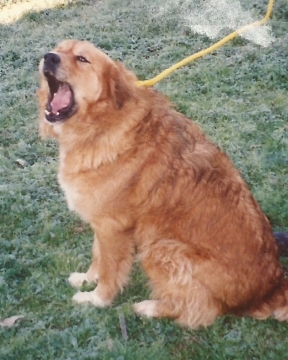 Pierson was rescued from Pierson Park in Kansas City, Kansas. That’s all the words I have on this very special Wordy Wordless Wednesday. 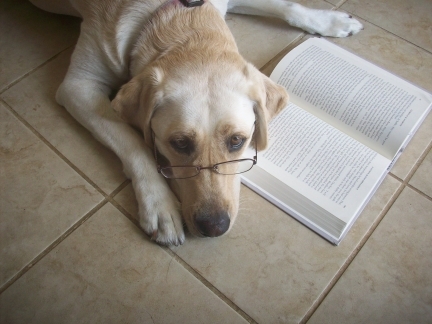 For more doggy fun, check out the blog hop link below. Animal Figurine Store.com has a very small selection of outdoor dog figurines which are safe to put into your beautiful spring garden. The selection is limited, but very adorable. Visit our Dog and Cat Figurines page at the Animal Figurine Store.com and look at the right side panel. 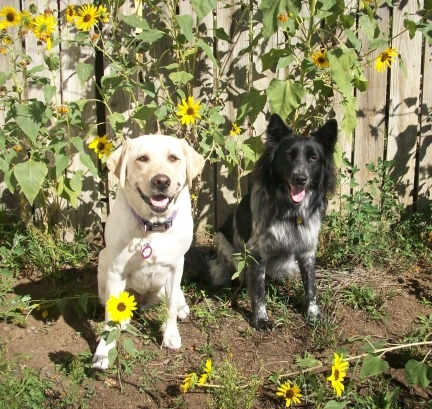 We have put the outdoor dog figurines on special for a limited time. Our outdoor dog figurines include two cute Beagle shoe planters and a garden statue of two children and their puppy dog on a bench.